This little girl, Ada Josephine Cowper, was born in Dublin in 1865 and her family lived at 29 Fitzwilliam Place. Thanks to the online availability of church records I have been able to find out something about her life. Her marriage, at the age of twenty-seven, to Ernest Henry Knox resulted in a move to his family home Greenwoodpark, Crossmolina, County Mayo where he was a land agent. The house which was built in 1814 is now a ruin. Ada had two children, Ada Eveleen and the exotically named Zinna Ethel! Zinna married into the Toler-Aylward family of Shankill Castle, Paulstown, County Kilkenny and it was there that Ada senior died at the age of 71 on the 6th of November 1936! 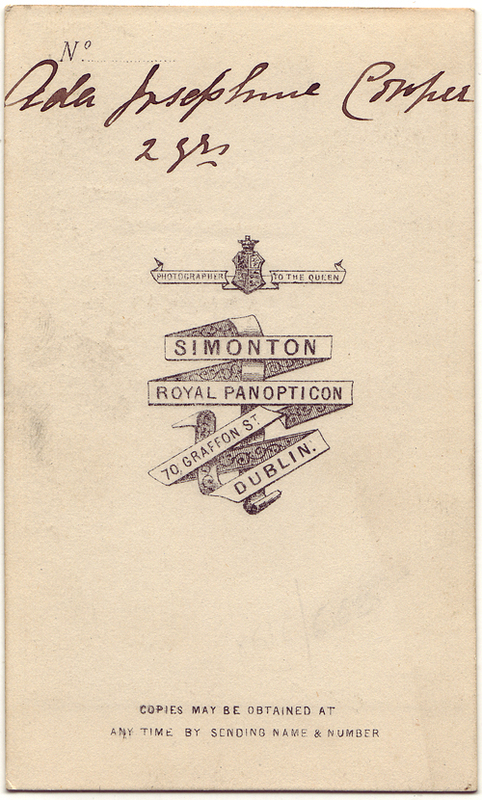 The grandly named Royal Panopticon of Science & Art was run by James Simonton. It opened to much fanfare in 1862, five years’ before Ada’s photograph was taken. Simonton had been involved in several photographic partnerships prior to this solo endeavour. Before establishing himself at 70 Grafton Street (note the typo on the card above), he was based on Dublin’s other main thoroughfare, Sackville Street (now O’Connell Street). Simonton spared no expense on the decoration and design of his new premises and an article in The Irish Builder of July 1862 elaborates upon the studio’s mahogany fittings, spacious staircase adorned with sculpture and ‘encaustic tile pavement and richly ornamented soffet.’ In addition to the photographic trade Simonton also displayed paintings, dioramas and scientific inventions. At the time of his marriage in 1859 to Frances Isabella Harricks he listed his occupation as ‘artist’ so it is no surprise that he was to host discussions on artistic matters. Simonton’s business thrived during the 1860s and early 70s as he benefited from the carte-de-visite craze, however, he announced in 1875 that he was retiring from the ‘fancy goods’ trade and filed for bankruptcy in 1876. He attempted to open a public house in the 1880s but his application for a licence was not successful. Instead, he reverted to photography and entered into partnership with a man called Edwards with whom he ran a business at 28 Grafton Street until 1883. This portrait shows Elsie Thompson Harrison of Brighton Square, Dublin in her nursing uniform and it was most likely taken during World War One. Her family are listed on the 1911 census as owning a hardware business and as being part of the Plymouth Brethern – an evangelical movement established in Dublin in the 1820s. Her brother had the unusual name of Gordon Trizzant Harrison and I was able to discover that her sister studied at the Dublin Metropolitan School of Art. I have located her on the online registers for the college: an excellent resource which is available through the website of the National College of Art and Design. The portrait was taken by a firm called Lloyd’s of Dublin. Directories show that they were based at 30 Grafton Street from ca. 1910 until 1939. It was run firstly by E. Henry Lloyd and then by H. Lawrence Lloyd. 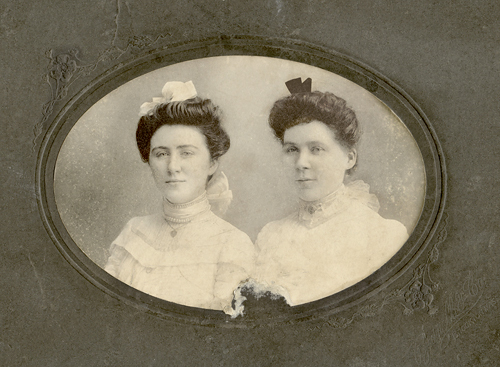 The format is sized between a carte-de-visite and a cabinet card and has beveled gilt edges. The printing process is quite like those which were popular with Fine Art photographers for their grainy and painterly effects. Whatever the process used by Lloyd, its warm hues and the soft focus add to the subject matter and lend a sombre atmosphere to the portrait. In contrast Lloyd also traded under the name of Mr Stickyback! See here for an overview of the sticky back photographic craze of the 1910s. 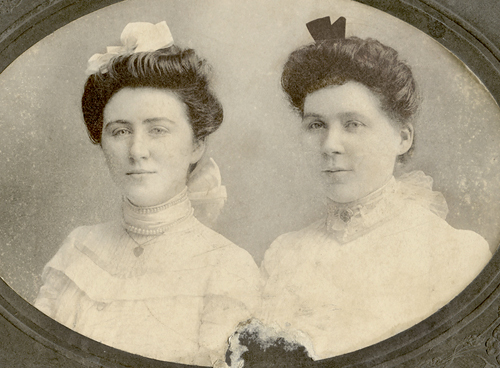 I was hoping to post this cabinet card for International Women’s Day but didn’t get the scan ready on time. This proud graduate marked her conferral by commissioning a portrait from Kilpatrick photographers of 8 Donegall Place, Belfast. Street directories show that the business was based there in the 1880s and the tight fitting bodice and high neckline of her outfit are in keeping with the fashions of that period. The lace detailing looks like either ribbon or Guipure lace and her slim silhouette was most likely created by corseting. Other nice details include the almond-shaped brooch, possible made of bog oak, which was worn high on her neckline. The hood of her academic gown was lined with either ermine or rabbit fur and you can also see a cane and the academic scroll in the image. The cabinet card format (16.5 cm x 11.4cm) was larger than the carte-de-visite (10.5 cm x 6.3 cm) and peaked in popularity in the 1880s. 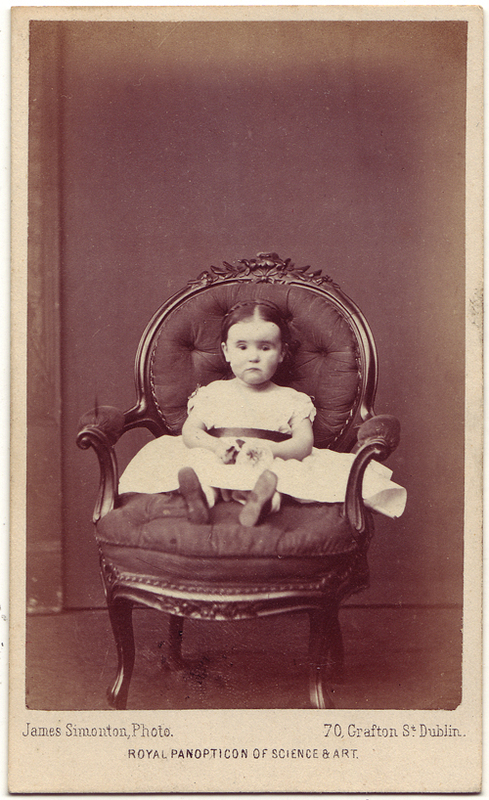 There are some fine examples on the excellent blog The Cabinet Card Gallery.